Apple’s diminutive media player box, the Apple TV, runs on iOS — the same operating system as the iPhone, iPad and iPod Touch. However, until now it was impossible to install and run iOS apps on it. Our friendly iOS developer Steve Troughton-Smith (@stroughtonsmith), who was one of the first to get Siri to run and respond on non-iPhone 4S devices, has come with a hack to do just that. Using a jailbroken Apple TV and some handy code, Steve was able to get the palm-sized Apple TV to run full iOS apps like Facebook, Angry Birds, Safari and even Cydia on his TV at a 720p resolution. What’s even more incredible is that Steve has been able to run iOS apps side-by-side, so someone can run multiple apps at once, though Apple TV’s 256MB of RAM is a constraining factor. 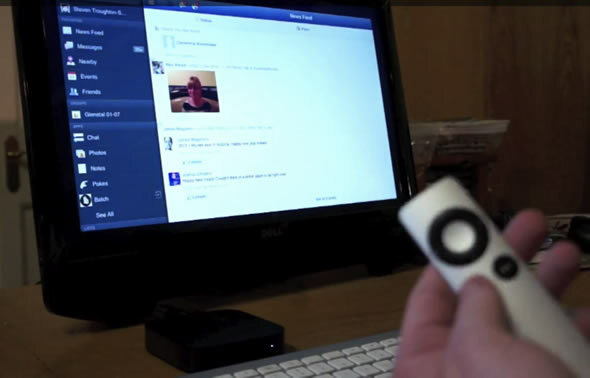 Steve is controlling the device with its remote and a Magic Trackpad. Video is after the break.